I'm excited that in about six days we'll be kayaking alongside the manatees in Florida's Crystal River -- with any luck, of course. Cross your fingers that the weather and the wildlife cooperate! I'll be sure to write all about it when we get back. The whole Florida trip has me thinking spring and kayaking, so I started a wish list of places to paddle in the area. Some of these places have been recommended by fellow paddlers; some have been on "my radar" for a while, but we just haven't had a chance to make it happen. What's that line from the Jim Croce song, "There never seems to be enough time to do the things you want to do once you find them?" Anyway, if you've paddled any of these rivers or ponds, please write in and let me know. Maybe we can get a discussion going about some great places. Thanks to Kim on go-paddle.com for some of these ideas. Finally, if all of this has you thinking about kayaking, I invite you to check out the East Hampstead Kayaking Group on Meetup.com. I recently discovered a great online resource for outdoor activities. It's a website created by Eastern Mountain Sports employees "as a gift to our customers and the entire outdoor community." You can find information here about trails for kayaking/canoeing, hiking, mountain biking, climbing, cross-country skiing, back country hiking and snowshoeing. It covers the entire USA, but you can easily search by state and your favorite activity. Check it out at www.mntnlife.com. 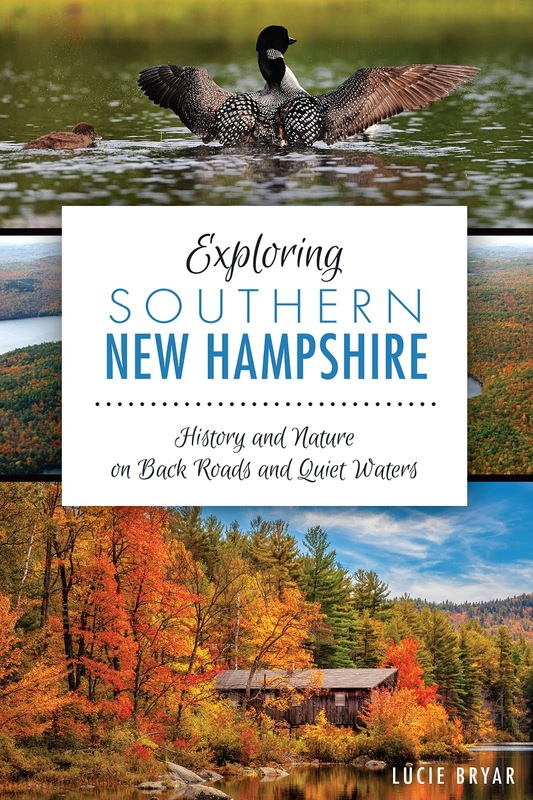 A search for snowshoe trails in New Hampshire, for example, returned a list of 70-plus locations! Some have reviews and ratings. If you register (free), you can take advantage of some added features like creating your very own favorites list or finding other like-minded souls interested in exploring the same place. The site also has events, such as mountain climbing clinics and snowshoe sprints. I did notice that kayaking results for our state are slim to none, although canoeing (which also fits the bill) has about six listings. I invite you to help other paddlers by adding a favorite trail or two of your own. This site is user-friendly and has great potential. Thanks, Eastern Mountain Sports! We celebrated Valentine's Day with a candlelight snowshoe hike at America's Stonehenge in Salem, NH. Tonight was the last night they offer the candlelit trail for the season, so I wasn't sure if I would share it here. But I thought it was worth mentioning, even if you file it away for next year. Basics: The Trail is 1.5 miles long through a lightly wooded area with some slight elevations. The folks at America's Stonehenge light the way with small kerosene lanterns, about every 100 feet or so. Cost was $10/per person if you bring your own snowshoes; $15 pp if you rent them on-site. Highlights: It was a clear night so we saw many more stars and constellations than we've seen in a very long time. I later learned that Venus was the brightest planet tonight, with Saturn a close second. I don't know much about constellations, but enough to pick out the Dippers and Orion's belt. We also saw lots of deer tracks. For Next Time: I would bring a flashlight and ski poles. I have night blindness and the trail wasn't nearly as well lit as I expected. It's a trade-off, I guess. If there had been brighter lighting on the trail, then the night sky might not have been so magnificent. Would definitely like to do a full-moon hike here. Treats After the Hike: Included in the admission price are coffee, tea, or hot chocolate and store-bought cookies available in the gift shop. You can sit and watch a short film about the archeological and astronomical mysteries of America's Stonehenge. There are also many 3-D displays, petroglyphs and other interesting artifacts. More Information: Check out their website at http://www.stonehengeusa.com/. 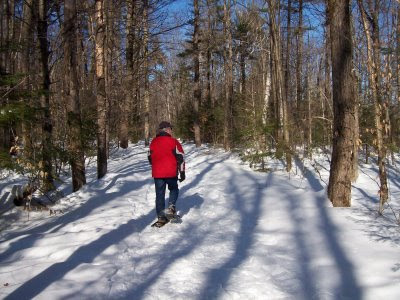 We set out for Heald Pond Trail in Wilton this afternoon to try out our new snowshoes. We didn't end up snowshoeing here after all because we couldn't find the trailheads and didn't have a map. (Note: This turned out to be a case of poor planning on my part. If I'd actually read the review in addition to the directions on http://www.mntnlife.com/, we probably would have found the trail.) Anyway, one highlight of the ride out there: we saw three deer on King Brook Road! If you've snowshoed or hiked here, please drop us a line and let us know. 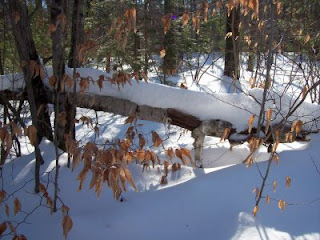 Once we got back, I checked out the Society for the Protection of NH Forests website to learn more about the property. After seeing this diverse and protected area, I definitely think it's worth a return trip. Next, we headed to Wasserman Park in Merrimack. By this time, daylight was starting to fade. We took a short hike on the Quarry Trail, a single file trail through the woods, about .5 mile long. 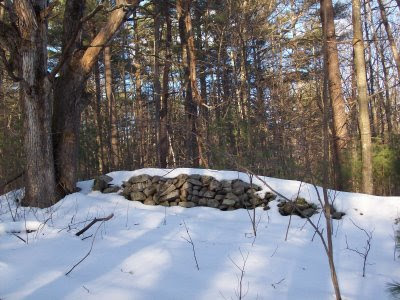 I just learned it connects (through private easement) with the Horse Hill Preserve, which is a 3.5 mile loop trail. Not sure how much of this is suitable for snowshoeing. But check out the website for decent trail maps. Our snowshoeing experiences so far have been pretty tame (some might say boring) -- probably because we're sticking to well-packed, mostly flat trails not far off the beaten path. The snow-covered scenery is pretty, but it's repetitive: snow, trees, rocks, and the occasional stone wall or wildlife tracks. Still, we're enjoying it. It gets us outdoors in winter to explore natural areas right in our own backyard. Snowshoeing is recession-proof. Once you buy the shoes, you can do it almost anywhere for free without paying entrance fees, lift tickets or rental fees. Have you tried it yet? Let us hear from you if you have a favorite trail! Let me start by saying I'm not the person to be giving advice on buying snowshoes--that's why this post is titled "tips" and not "how to." If you need help buying, you can research online or find a knowledgable salesperson, which is what we did. All I'm offering here is a little bit about our experience buying his and hers snowshoes last weekend. There are a couple of basic things we learned. One, not all shoes are suitable for all types of snow and terrain. So first decide what type of snowshoeing you'll be doing. That could be on level, well-packed trails (that's us); or it might be blazing through deeper snow or climbing up mountains. Second, snowshoes are sold in three or four basic sizes, based on your weight fully bundled up. One clever manufacturer has a scale near the snowshoe display. The idea is to step on the scale--which fortunately doesn't show your weight--but instead indicates your snowshoe size. The most common sizes are 21, 25, and 30, which equate to small, medium, and large. There are variations on all of this, depending on brand. But we learned not to be taken in by the scale. Scales can lie. The helpful salesperson at Kittery Trading Post (yes, in Maine!) said the weight charts were more reliable. By the scale, Doug should have bought a 30, which is a longer, wider snowshoe. It just didn't fit his medium build and our salesperson concurred that he should stick with a 25, which is what I also bought. While there's a 40-pound weight difference between Doug and I, we ended up with the same size, but not the same style.I bought a woman's style (shown above), which is tapered in back, making it lighter and requiring less of a wide stance. A Note on Bindings: What we were most concerned with here is how easy they were to operate. 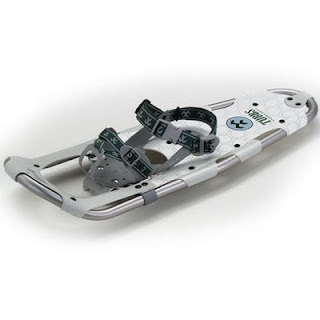 We bought the Timberline snowshoe sold by Tubbs (on sale for about $130). This particular shoe has a single cinch pull binding. Once you put your foot in the shoe, you pull up on one strap and then secure the heel strap in back. That's it. Seems important to have an easy binding when you're outdoors bundled up in a ski parka, with gloves on, and the wind is whipping around you. One last tip: some snowshoe designs are more apt to kick snow up your pant leg as you walk-- a problem that can be remedied by wearing ski pants. I'm not sure if this has to do with the pivot of the shoe or the curve of the platform. I mention it here so you can be sure to ask your salesperson about it or research before you buy, if like me, you'd prefer not to add a layer of clothing. Happy snowshoeing! Remember the fun and anticipation of getting outside to build a snow fort or a snowman when you were a kid? I feel some of that same anticipation about snowshoeing. It's been a long time since I've viewed snow as an invitation to "go outside and play." We left our household chores undone yesterday and headed out to the Massabesic Audubon Center in Auburn, which borders Lake Massabesic. Our reward was crisp air, sunny blue skies, and a clean blanket of snow. A great way to recharge our spirits and get a little exercise! The Center rents snowshoes ($8) and provides a map -- although there are only three main trails and they're pretty well marked. We started out in an open field which was windy, but very soon the trail led us into a more protected forest. I liked the fact that there were many tall, beautiful trees, but lots of open sky, too. One trail led us to Lake Massabesic (more than 2,500 acres large) and of course, with the cold temperatures we've had, it was safe to venture out onto the lake. We also explored an osprey blind, a small hut with comfy chair and window overlooking the water. I don't know much about these large raptors, but since they survive on fish, I guess they migrate in winter. Even though the Audubon Center was busy today, with lots of people renting snowshoes, we weren't crowded on the trails at all. We spent an hour or so crunching through the snow and enjoyed every minute of it! Things to Know Before You Go: The Massabesic Audubon Center is a lively, family-friendly place. They have ongoing programs, exhibits, and live animals including a barred owl, a snapping turtle, a python, some mice, and even Madagascar "hissing" cockroaches. For More Information and Directions: Visit their website, call (603) 668-2045 or enter their address into your favoite online map or GPS: 26 Audubon Way, Auburn, NH.